May the best driver win! Be safe and buckle up! Ooohhh you two are on the Pit Crew??? Pawsome! 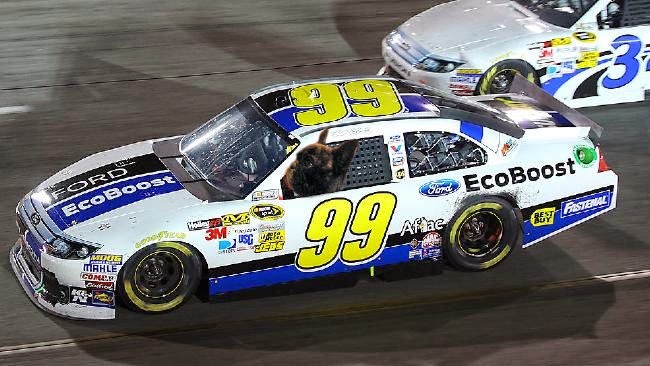 We watched the race with Dog Dad last night. It was so awesome. We can't wait to find out who won the prize since there were multiple picks for the winning driver. That is just adorable! We're huge race fans in this house...Harvick all the way!!! Happy Racing, a car with Frenchie-power will win, that's for sure :o) Have agreat memorial monday. Happy racing to you both and have a fun time. Have a great Memorial Day and a marvellous Monday. We know that Jimmy Johnson won the race. Now we have to find out which doggie won. Was it you and Edward, Lily? You guys look so cool! Finley won! Which means I won since I'll get to share da cookies! You two are going to need helmets. How could two cuties like you loose?!! Whooo Hooo, Go team Frenchie! This is just to funny! The French are taking over the race. Oh wait, I take that back. The FRENCHIES are taking over the race.